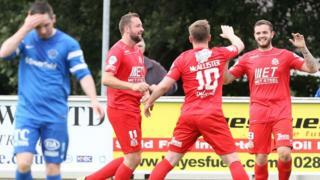 Portadown secure victory at Ballinamallard United thanks to goals by Darren Murray and Ken Oman. Liam Martin netted for Ballinamallard and the County Fermanagh men missed chances to salvage a point. Ronnie McFall's Portadown are third in the Irish Premiership table having won three of their opening four league fixtures.